Dover, 1960; Blackwell Street. By Henry Boschen © Click to enlarge. Re-posted by popular demand from 2015. Henry Boschen (1922-2011) made this wonderful black and white image in 1960 on Blackwell Street in Dover, New Jersey, a blue collar town in Morris County which was founded in 1869. In 1960, before the Rockaway Townsquare Mall was built in 1977, Dover was the place to go for shopping. It was a diverse town, and many of the merchants were Jewish. A growing Hispanic population was beginning to change the personality of Dover. Spanish restaurants and credit unions were opening. Most of the immigrants were from a particular town in Puerto Rico. 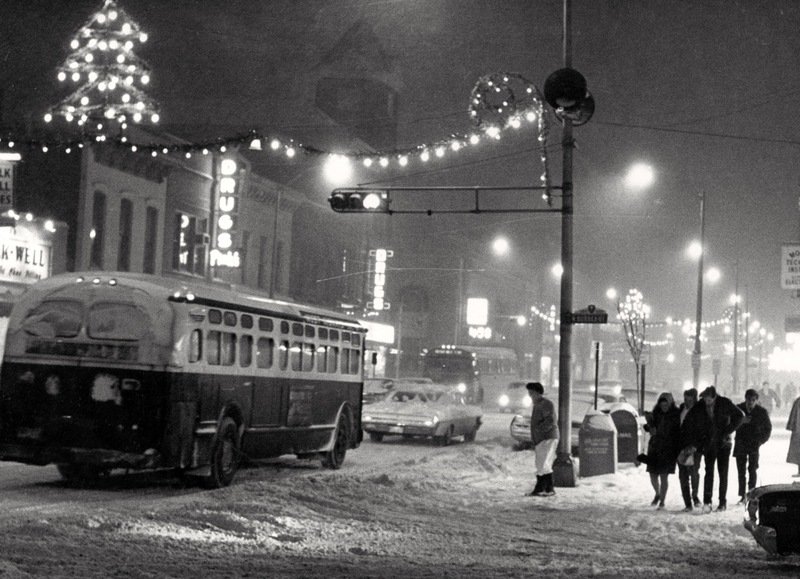 Henry’s image captures the warmth of Christmas in 1960 when shoppers would flock to visit downtown Dover where an old-fashioned homespun style was found in the shops. You could buy a fine men’s suit at the Quality Shop and pick up fresh fish at Fred’s. The Walk-Well shoe store was a family business, as were many of the stores downtown. Dover Photo was one of the few Leica dealerships in New Jersey, so aficionados like me would go there to buy lenses, superb cameras and darkroom gear. Murray and his sons would offer technical advice to visitors. They displayed original photos and they offered trade-ins on equipment. I was one of their best customers. Dover General Hospital, known for its excellent nursing and physician care, was sixty years old that year and was within walking distance to downtown. It was founded by a group of Dover women who wanted to improve healthcare at the turn of the century. My first medical office was on Blackwell Street. I chose Dover because they had no cardiologist and I wanted to work in the trenches instead of at some ivory tower. The National Community Bank downtown gave me a mortgage before I even saw my first patient. The town doctors told the banker that I was a good risk. My practice was busy from day one. Henry Boschen, my patient and friend, gave me this print, and it is a great treasure.